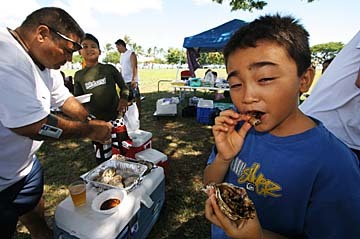 Honolulu Christian Church held its annual Labor Day picnic yesterday at Manoa District Park. 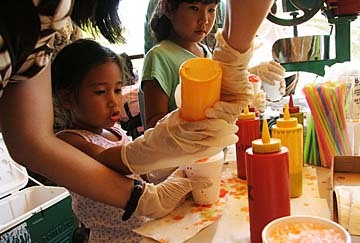 Logan Brown, left, and Kylee Kim made shave ice. People flocked to Ala Moana Park yesterday to enjoy Labor Day. Eight-year-old Jessie Madiro took a bite of an oyster hot off the grill as Thomas Rodrigues fixed more.